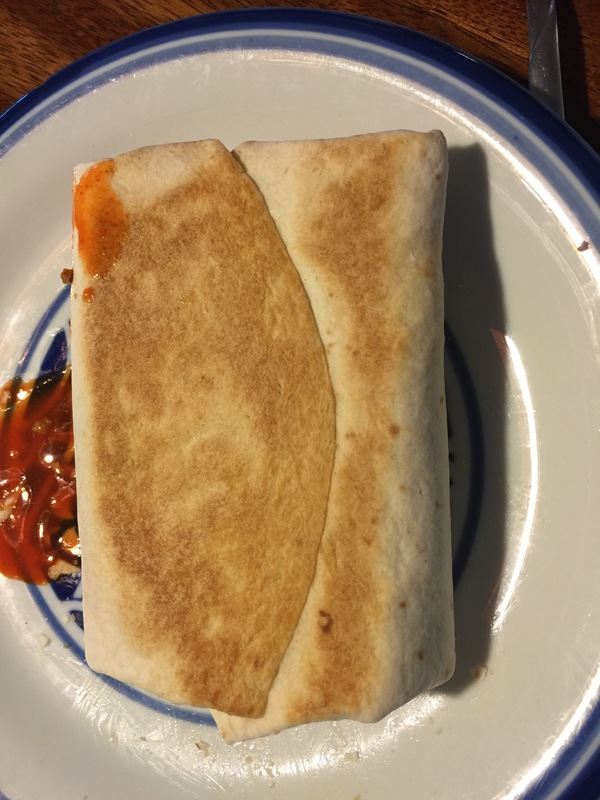 Is it a burrito? Is it nachos? My husband made up this tasty fusion in a fit of desperation when I was away from home and I have to say, it’s delicious! 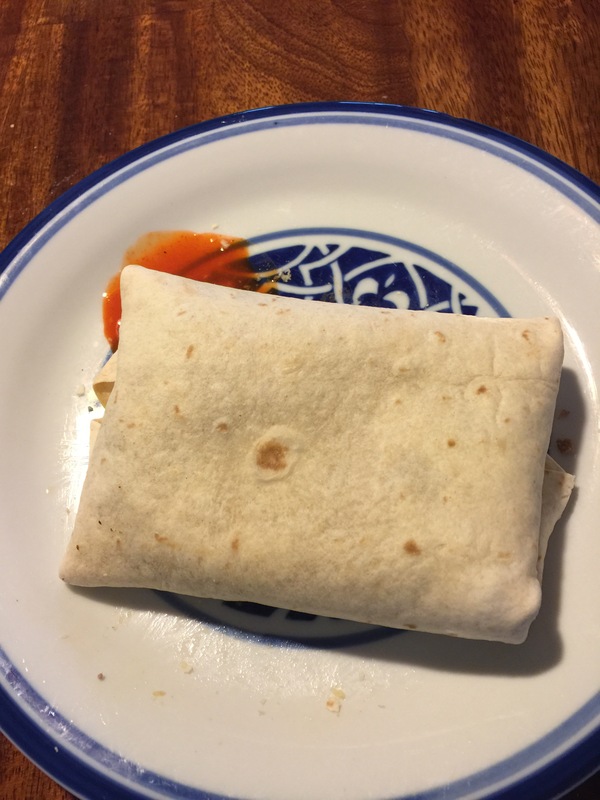 The burracho combines all the great parts of burritos and nachos into one tidy package. 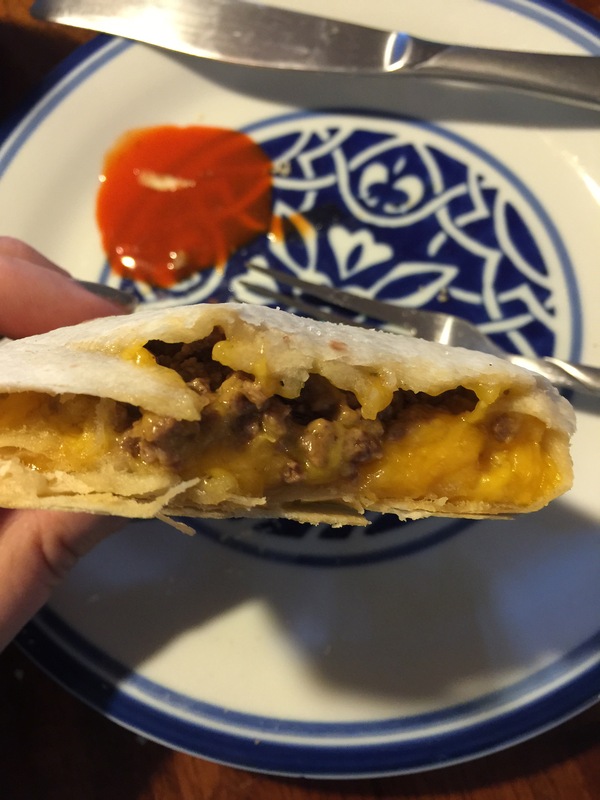 It has taco meat, cheese, tortilla chips and anything else you might enjoy. We added chopped green onion, but diced tomato would add a lot of great flavor as well. The crushed chips need to be small enough they won’t poke your mouth but big enough to add their flavor to the mix. No bigger than a quarter is good. Preheat oven to 450. Cook ground beef with taco seasonings (or just use 1/4 tsp each cumin, chili powder, smoked paprika, garlic powder and onion powder). Drain meat. Spray a baking sheet with nonstick spray. In the center of a tortilla, layer a spoonful of ground beef, shredded cheese, crushed tortilla chips, onion & tomato (or a scoop of salsa). Fold in the left and right sides, then the top and bottom sides. Don’t pull too tight or the tortilla can rip. Place seam down on the baking sheet. Repeat until you have as many as you want to make. We did 5 and had at least 1/2 the meat left. Place in the oven for about 12 minutes. The shell should be firm but not hard. Pro tip: You can do interesting things, like brushing with melted butter, a dollop of red sauce or cheese. Make it your yum. Serve with whatever salsa or hot sauce you like. This past week has been rough for America, on top of an already rough year. I don’t think any sane American can look over the divisive political race or the devastating number of people shot through various means and think everything is peachy right now. I don’t have an answer or a solution or even advice for other people who are dealing with this; I can only speak for myself. Through the past year, I found myself becoming more vocal about certain situations, and the more I tried to persuade people of the very logical and rational things I was saying, the more angry and frustrated I became. I made a conscious decision not to post anything about the political climate on my Facebook page because I didn’t want to draw in the ire of those who might disagree with me, or those who wanted to try to convince me of their opinions, nor did I want to offend people I really like and care about who have different opinions from me. It’s a well known fact that you can’t change someone’s mind by arguing with them on the internet, and if it isn’t a fact it should be. The internet gives us the ability to think through our arguments, planning with carefully researched data points and articles to reinforce our position, but to what end? The other guy is doing the same damn thing, and all it really does is bolster our own opinion of how right we are. So, no more politics on my page. I was much happier, until last week. We saw some terrible events unfold last week, and I was truly devastated by them. Those of you who know me know I am extremely patriotic. I fly my flag, I support our troops, I teach my Girl Scouts patriotic songs, I place flags on veterans markers at the cemetery. I cry when I read about the death of a police officer, heck a police dog will have me bawling. I respect our law enforcement officers and I fear for the LEOs I know because their jobs are dangerous and getting worse every day it seems. Strangely enough, if you believe that police brutality should be investigated and eliminated, to some people that means you are anti-police. This is not the case. The same as I believe doctors should not be given a pass on malpractice that injures a patient, a police officer should not be able to use excessive force in the performance of their duties. There are thousands of police officers who maintain ethics and standards every single day, regardless of the fact that they usually see Americans at their worst. They do not roll up on people in the best mood of their lives, happy and sharing lemonade and sunshine with all who cross their paths. The fact remains that the percentage of officers who find themselves in the spotlight or on the evening news is a very small percentage of officers in America, but these are the ones shaping the country’s view of how law enforcement works. These are the exception to the rule, and these are situations that warrant an investigation. After the shooting of a man sitting in his car, I said something on a friend’s post. What I said at the time is not important. What is important is that a mutual acquaintance took offense to what I said. He not only argued at me in public, but then followed me into Facebook Messenger and sent me messages every day for several days. I repeatedly told him to stop messaging me, which he ignored, all so he could “prove he was right” about me. Whatever that means. He accused me of not supporting the police because I didn’t change my Facebook status to denounce the terrible shooting of police officers in Dallas, all while ignoring the fact that I hadn’t said anything about any shooting of any person. Do I really need to publicly state that I am devastated, outraged and weep for our country? Do I really need to justify myself to someone I have literally met one time for five minutes? This has led me to evaluate how I use Facebook, and I think I’m going to stay silent for a while. I’ll be there, looking at posts and pictures, I might even like some. I don’t think, though, that I am going to be using it to define who I am for someone who doesn’t really know me. Facebook is something that makes you feel like you know someone, or makes you feel like you are keeping in touch with friends and family, when in reality people really only post what they want you to see about their lives. If you want to really get to know me, shoot me an email, find me at an event, make friends with me. I love coffee and wine, not in the same glass and not at the same time, but both are good with conversation. I’m not all that bad and I bet you aren’t either. I might disagree with you on something, but that doesn’t make either of us bad people. If we can talk about our opinions in a healthy fashion, it might actually make us better friends and stronger individuals. It’s amazing what actual conversation can do. Until such time as I don’t fear I will be harassed by someone who doesn’t know me, I’ll be staying silent. I understand that everyone’s experience is different, but I am getting a little tired of the proliferation of articles comparing childhood in the 70s to childhood today. Parenting blogs glorifying the disco decade and lamenting how horrible today’s kids are seem to be missing the point. The 70s were not some Garden of Eden for children, the same as children today are not all tiny megalomaniacs. If a contemporary parent allows their kids to slack on chores, dictate what the family does on the weekend, speak disrespectfully or demand expensive possessions, it’s not because the 70s were wonderful. It’s because the parent allows it, end of conversation. There were rude, entitled little assholes in the 70s, too. Yes, my 70s childhood was great – we played outdoors, read books, made up games, rode bikes without helmets, and did our chores. With the exception of the bike helmet, my kid does the same things, plus she is smarter, has better opportunities, and can be expected to live a longer, healthier life. She can’t conceive of riding in a car without a seatbelt or attending a gathering where all the adults smoke in the house and around the kids. The next time you are tempted to shout “This, right here!” after one of those “the 70s were wonderful” articles, just remember what we had to wear, disco music, there were 7 channels to watch, and Corinthian Leather hadn’t yet been exposed as plastic. We lived with the possibility of a Russian nuclear attack, soaring inflation and an evolution of the two income family as a requirement rather than an optional status. A cancer diagnosis was a death sentence, and gays and minorities were routinely discriminated against, harassed, and assaulted. It wasn’t a perfect world by any stretch. However, the values we learned in the 70s are no different from what parents today have the ability to teach their children, but in some cases, choose not to. It doesn’t have to do with the decade, but with individual parenting choices. In 30 years, there will surely be articles lamenting the way midcentury children are being raised and comparing them with millennial children. Hindsight is not only human nature, it is also a romanticization of how things were. Let’s not fixate on how parenting happened circa 1975, but instead focus on what we parents can do today to raise our children to be good people. If that means letting them have the more expensive shoes or clothes, that’s your choice to make, but own it as YOUR CHOICE. Don’t blame trends, or parenting blogs, or even the good old days. You are the parent your child will blame while they are in therapy. You are the parent they will either emulate or do the opposite of when they are raising their own little people. It is easy to get caught up in the parenting one-upmanship (and I guarantee our own parents struggled with these types of issues too, but they managed, even during the wasteland of no internet during the 70s and the yawning decades of no tech before that) but please, resist if $200 toddler sneakers aren’t the right choice for your family. Want them to appreciate their privileges? Make them work for them, volunteer at a shelter, mow the lawn, whatever is the right thing for your family. Choose to raise your kids with the values you want them to have. Just because you have internet doesn’t mean they get to use it 24/7/365. They will appreciate your efforts as adults when they are hearing from other parents about how spoiled and undisciplined, outspoken and rude children are becoming; they will have the secret weapon of good choices in their arsenal to raise your grandchildren to be good people. My husband and I have a funny fascination with Japanese and Korean pop music (aka J-pop and K-pop). I’m not really sure why we are drawn to these, but we also love some wonderful Japanese dramas and are watching a funny Korean show called You’re Beautiful (about a girl who poses as a boy to save her brother’s job in a boy band, what’s not to love??). This is on Netflix, btw. Our favorite Japanese drama was called Haru to Natsu, and chronicles the story of two sisters separated by the Pacific Ocean and recaps their lives after they are in their 70s. It was one of the most emotional programs we have ever watched in any language. If you can find this program, it’s well worth the subtitles! As for the music, the melodies are catchy, sometimes to the point of ear worm level, and videos have high production values. Here are some of our recent favorites. Our troop has grown a little this year and we have several new members who have not sold Girl Scout Cookies before. They are excited and so enthusiastic! It has really inspired some of our continuing members to step up their game and try harder to achieve their goals. As a leader, it isn’t always easy to teach or lead the girls to cookie sales success. Especially for Brownies, they are still in the realm of needing to be lead to their goals to some degree. They are not always good at math. They don’t always grasp what Cookie Share is or does. They sometimes forget that we raise money for fun AND to give back to others. For our first meeting covering cookies, I made them a poster to help with some of the information they need to remember. We plan to use this at our booth sales and show a bar chart of our troop goal achievement. For our second meeting, I wanted to be sure they knew their math and money management. It’s easy to get confused when giving out change or having to count money, so while a parent would be helping during individual or booth sales, it is important for the girls to know this information. Fortunately for us, cookies are priced at a good multiplication factor – $5 per package. I found a game online that I adapted for the girls. We played this as a tournament – we had five pairs of girls, then the winners played each other. The girls loved the dice and so they were given out as prizes at the end of the meeting along with the play money. The girls learned visual recognition of the cookie varieties as well as reinforced their knowledge of common pricing in a selling situation. The game can be expanded for older girls to use more money and to keep track of the number and type of cookies “sold” during the game. I feel really good about this game! Feel free to download the images and use them yourself. I didn’t make up the game, but I did adapt what I found online into something my girls could work with, you can too!